Your world of yachts Yachts from A to Z! The largest pavilion of the boat show Boot Düsseldorf 2019 starts in 10 days, and shipyards participating continue to slowly tell what is going to surprise visitors. The French company Beneteau is no exception. 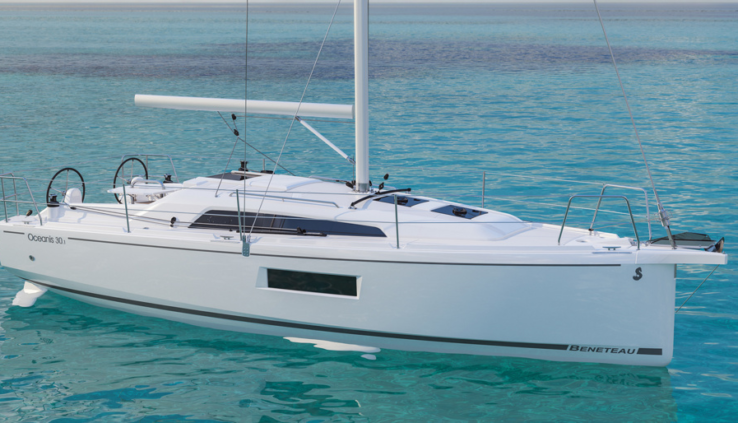 In addition to the previously announced sports motor cruiser, they will show also the smallest in its lineup (only 9.5 meters) cruise sailboat Oceanis 30.1. “It is likely that someday she will receive the title of “Best in class”” — without false modesty say in Bavaria. Displacement 30.1 Oceanis does not even reach four tons. Experts Finot-Conq architects and Nauta yachts design has developed four versions of the boat. In addition to the standard version with a draft of 1.88 m, future owners will be able to order a version with a short keel and a smaller draught (1.3 m), turning keel or retractable keel. Thanks to this boat is suitable for coastal navigation with the sunset in the rivers and canals, and offshore travel. To think of the boat so that everyone found something to his liking, appears to have been one of the main objectives of the creators of the Oceanis 30.1. Judge for yourself: those sailors who prefer the comfort, will stop on a variant with two wheels, next to which is located on the cockpit foldable table and benches for six people on the sides. Thrill seekers and those who are accustomed to the surroundings, choose a tiller with dual shaft (and the freer the cockpit). For beginner sailors and for short voyages on the boat you can put a 15.7-meter jib of the machine. For the purposes to install a large 22-meter overlapping Genoa, emergency cleaning sails or 70-foot asymmetrical Spinnaker. Below deck on the Oceanis 30.1 guests will find two cabins with double beds fore and aft, and between them an open space with a small galley and wardroom with a folding table and two sofas. Maximum boat width of 2.99 m and height of cabins varies from 1.85 m to almost 2 m.
Anniversary, 50 at the exhibition Boot Dusseldorf will be held in düsseldorf from 19 to 27 January. The wind, what are you doing!